Watching the pilot episode of Three’s Company for the first time in–I’m gonna say 25 years–I was slightly horrified to discover that I not only remembered the plot, which is pretty straight forward, but individual jokes, word-for-word. I guess this sit-com that ran from 1976 to 1984 made a bit of an impression on my young mind. What I remember most are the final moments when Janet tells Jack how she convinced Mr. Roper to let him live there. “I also told him that you were gay,” she says, and Jack falls off the couch. I had to ask my mom what gay was. I’m not sure I understood it even after her honest and open-minded explanation, but the ruse of Jack pretending to be gay is at the heart of the show’s premise. In case you don’t remember or are under 30, the pilot opens with two women, bombshell Chrissy (Suzanne Somers) and petite Janet (Joyce DeWitt) cleaning up the remnants of the previous night’s party. Their modest two bedroom apartment isn’t much worse for the wear, except for a punch ladle that has turned green from soaking in a mysterious alcoholic liquid. They quickly discover a man asleep in their bathtub. They wake him by turning on the shower and wielding the discolored ladle as a weapon. 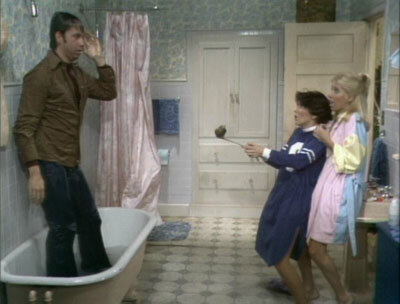 The man in the tub is Jack (John Ritter). He’s a little doofy, and taken with Chrissy, but seems like a reasonably nice, normal guy. The women are looking to replace their previous roommate, for whom last night’s bash was a going away party. The clincher is, he’s an amazing cook. Deciding he would make an ideal roommate, they plan to invite him to move in. Here’s where you have to use your mental wayback machine. Since that would be no big deal, this show could never work today. Each of the trio has his or her own quirks, but the wacky in the show comes from the Ropers, an older married couple who live downstairs and manage the building. The writers hit us over the head with the fact that Mrs. Roper (Audra Lindley) has a sexual appetite that scrawny Mr. Roper (Norman Fell) just can’t satisfy. This role reversal, if you consider it that, is another point where the show was probably edgy for its day. When everything comes out in the open and Mr. Roper finds that the women are planning to have a man move in, he is outraged. However, Janet quickly smooths things over, only we don’t know how until that final moment I mentioned above. So, we’re set up for all kinds of potential misery, with a straight man forced to pretend to be gay, while simultaneously attracted to his hot roommate. One more thing that would happen today that didn’t then: Jack and Chrissy never get together. Granted, her character left the show after four seasons, to be replaced by other hot blondes. But in a sit-com pilot today, where a guy and two girls were introduced in this situation, it would be almost a given that somebody was sleeping with somebody in the season 1 finale. So watch this show, if not for its campy humor and laughable 70s attire, for the fact that it’s different from what we’re watching these days. This entry was posted in 1970s, Comedies and tagged 70s, chrissy snow, gay, jack tripper, janet wood, john ritter, joyce dewitt, l.a., mr. roper, mrs. roper, suzanne somers, three's company by meekthegeek. Bookmark the permalink.